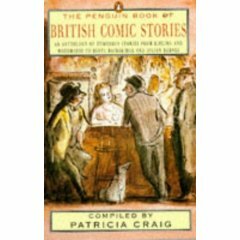 The Penguin Book of British Comic Stories: An Anthology of Humourous Stories, ed. by Patricia Craig, Penguin Books, 1992, ISBN 978-0140122923, 544pp. In this case, comic means humor (or humour, since this is a collection of British stories) rather than sequential art. Although, given the low laugh quotient, the definition of comic as humorous may not be exact either. It is a problem with any anthology of this type–that is, trying to cover such a broad range in both time and style–that the reader isn’t going to find every story to their liking, but this one for me didn’t even come close. I’d hesitate to actually term more than a third of these stories as smile-inducing, and only about a tenth actually had me laugh out loud. I enjoyed just a few of the other stories, including Julian Barnes’ “The Stowaway,” about some animals that you don’t think of as being on Noah’s Ark, not to mention some of the other details that got left out of the official version; V.S. Naipaul’s “The Night Watchman’s Occurrence Book,” about what goes on overnight in a tourist hotel in India; and “Raymond Bamber and Mrs Fitch,” where the dullest member of a cocktail party gets something of a comeupance. I paid less than $10 for a hardback version of this, so I regret more of the time spent with the stories that I didn’t care for as much more than my monetary outlay. On the whole, I’d suggest a pass on this. Even if your tastes are opposite mine, I don’t think this will likely fill what you expect from the title.